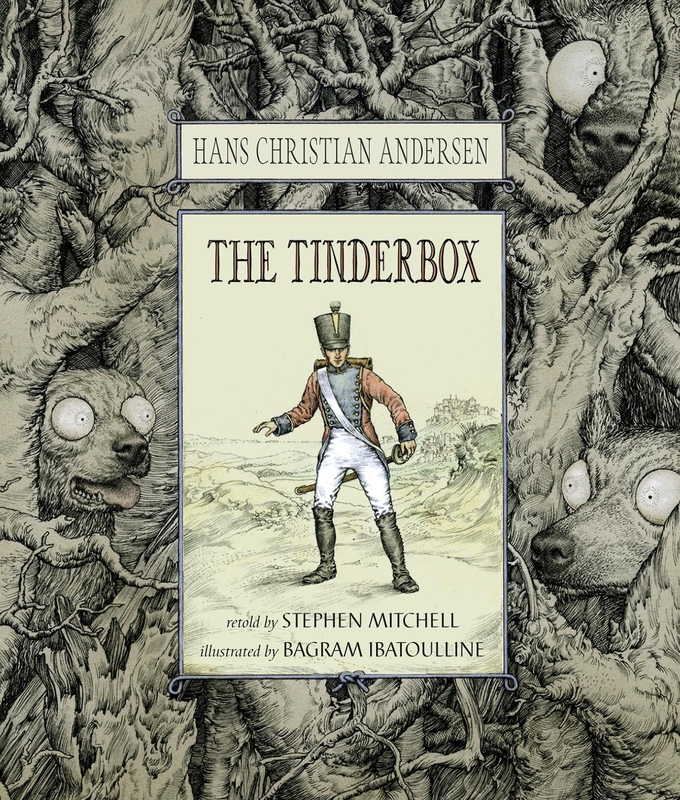 Fortune is fleeting for the handsome soldier until he learns the secret of the witch’s tinderbox and her three magical dogs—each with eyes bigger than the last. With a strike of the tinderbox’s flint, a dog appears to grant him his wish. The soldier doesn’t hesitate to take advantage of this gift—at a high cost to the kingdom. With his signature wit and clarity, Stephen Mitchell gives a wonderfully fresh retelling of Hans Christian Andersen’s tale. The story is perfectly paired with Bagram Ibatoulline’s richly detailed illustrations, creating an exquisite new edition of a classic. A soldier came marching along the road: left, right! left, right! He had his knapsack on his back and a sword at his side, because he had been to the war and now he was on his way home. “But what am I supposed to do once I’m down there in the tree?” the soldier asked. “Get money,” said the witch. “When you reach the bottom, you’ll find yourself in a large hall. It will be very bright, with hundreds of lamps burning. Then you’ll see three doors. The keys are in the locks, so you’ll be able to open them. “When you enter the first room, you’ll see a large chest in the middle of the floor, and on it there will be a dog with eyes as big as clocks. But don’t worry about him. I’ll give you my blue-checked apron; spread it on the floor, then grab the dog, put him on my apron, open the chest, and take as much money as you want. The coins are just copper. “If you’d rather have silver coins, you’ll have to go into the second room, where you’ll find a dog with eyes as big as dinner plates. But don’t worry about him. Put him on my apron, and then take as much money as you want. The soldier climbed up the tree, went through the hole, then lowered himself down to the bottom, and found himself, just as the witch had said, in a large hall where hundreds of lamps were burning. Mitchell’s retelling is excellent. Ibatoulline’s expansive spreads, elegantly drawn in detailed pen and ink, resemble etchings; appropriately, the added watercolor is in delicate yet somber tones… A sumptuous setting for this strange, profoundly provocative classic. A most unusual and spectacular book. Another exquisite re-telling of an old tale, for older readers with concrete nerves. While the tale is so well told it will stand by itself, the illustrations add to the magic and wonder of the story… A book to be treasured.